Situated a km off the Kanchipuram railway station, this Divya Desam has been designated as a heritage temple and is under the archeological survey of India. The story goes that a Gandharva beauty tried to distract Baradwaja Rishi in his penance. A child was born to them and a perturbed Rishi prayed to Brahmma regarding the child’s up bringing. Vishnu and Brahmma came to his rescue and promised to take care of the child. During the same period, a Pallava king, who was childless, was undertaking penance. They presented this child to the Pallava King and named him Parameswaran. Another story goes that Lord’s security guards, Dwara Paalakaas, are said to have born to a Vidarbha king, who was childless. Later the two are said to have performed the Ashwamedha Yaagam, upon which Lord Vishnu is believed to have appeared before them. Mothers Parvathi, Mahalakshmi and Saraswati came down to earth once to perform penance. Sages Athri, Brugu, Kashyapa, Kaundilya, Triorisheya, Bharadwaja and others helped them. After a while Lords Brahmma, Vishnu and Shiva came there to take the mothers back. The power of the penance of the Rishis was such that the Lords could not go near their consorts. They sent a beautiful Gandharva virgin near the sages. Sage Bharadwaja fell in love with her and had a son. Lord Maha Vishnu took the form of a hunter and brought up the boy and named him Parameswara Varman. He was a staunch Vishnu devotee since his infancy. Lord Vishnu taught him all the arts. By the time he was completing the courses, his life was coming to end. In order to extend his life to a long span, Lord reclined with his head on the northern side. Generally, it is believed that this would affect longevity of the person. When Yama the God of Death came to take the boy, he was shocked to see the Lord with His head towards north and understood that some thing bad or strange would happen. Lord simply told Yama that He would move only if he ensures long life to His devotee. Yama had no choice. He simply obeyed and turned away assuring long life to the boy-Parameswara Varman. Boy Parameswaran asked the hunter-father who He was. Lord granted him His darshan. 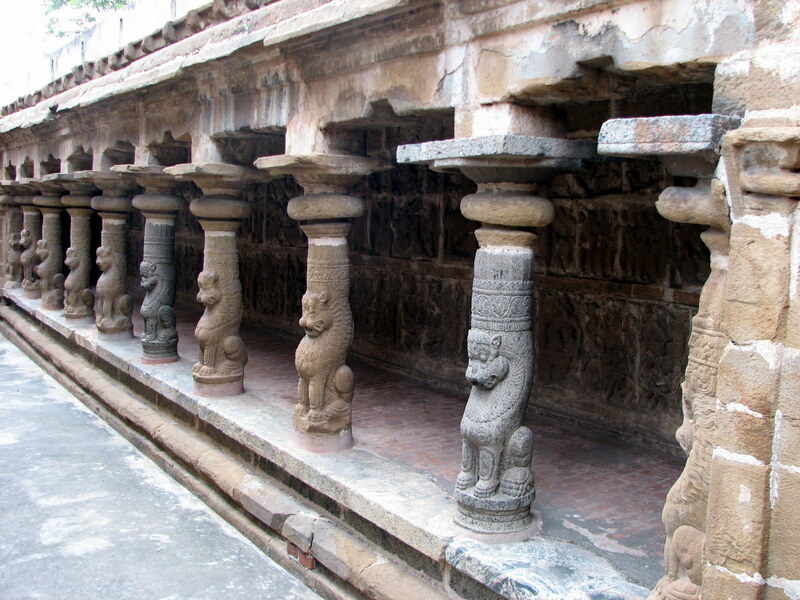 Parameswara Varman decided to build a temple with Lord’s three postures, standing, sitting and reclining. According to some historians that Parameswaran was the first of the Pallava dynasty. In his Mangalasasanam, Saint Tirumangai Azhwar mentions Parameswara Varman as the builder of Parameswara Vinnagaram – “Parameswara Varman Panindha Parameswara Vinnagaram Adhuve”. The place is also named after him. As Azhwar’s Mangalasasanam has the name of the King, the grace of Lord to him stands established. Mukunda Vimanam in the sanctum has the features of Ashtanga Vimana also. The Lord is Paramapada Natha in the first sage in sitting form and in standing form at the third. 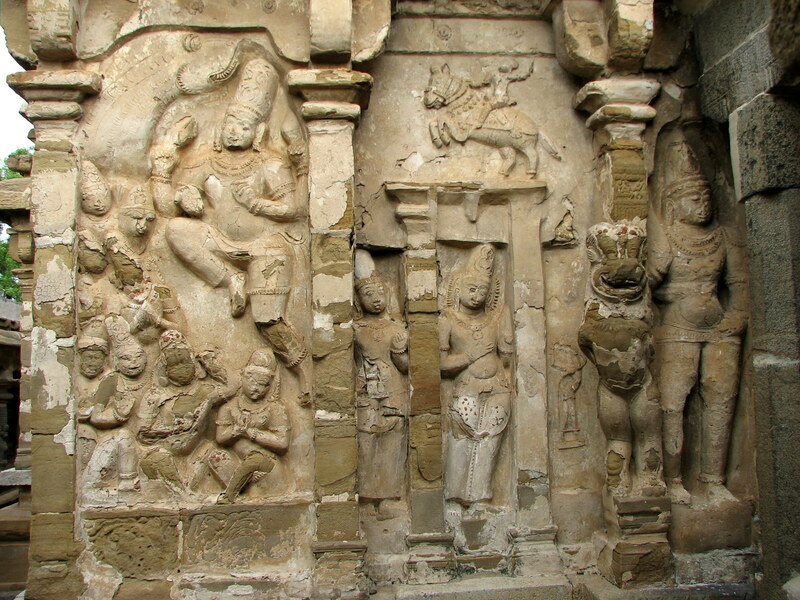 In the middle, He is in reclining form as Sri Ranganatha with Mothers Sridevi and Bhoodevi on the Adisesha with His head at the north facing west. 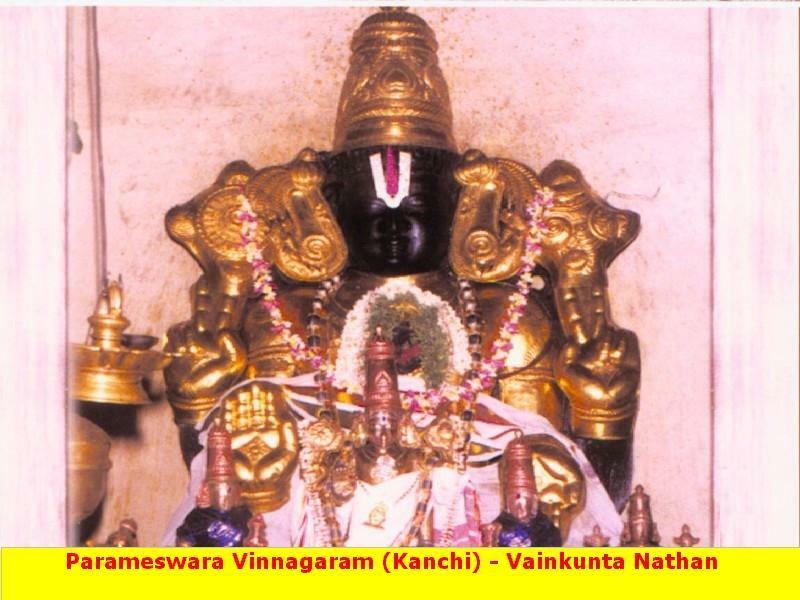 The extension of longevity to Parameswara Varman it is said was granted on a Vaikunda Ekadasi day, also a Wednesday. Worshipping Lord on this day will increase the longevity of the devotee, it is believed. It is also believed that this Kanchi Vishnu temple is the first of the Divya Desams in this region. The region was once known as Vidharba Desa ruled by King Virocha. Due to a curse incurred in his past birth, he had no issues. A staunch Shiva devotee, he prayed to Lord Kailasanatha in Kancheepuram conducting a yajna. Lord Shiva made the Dwarapalakas of Lord Vishnu to be born as the king’s sons. Though born as the princes, they continued to be devotees of Lord Vishnu and conducted a yajna for the welfare and prosperity of the people of this region. Pleased with them, Lord Vishnu granted darshan as Vaikundanatha to the princes. Lord is said to have appeared before the devoted Parameswara Varma in his three postures. Lord Vishnu is believed to have stood up and taught Parameswara 18 different arts of life. In his grand sitting posture, he is said to have passed on advice to Parameswara, as an acharya would to his disciple. And is then believed to have got into a sleeping posture so as to be served by Parameswara. 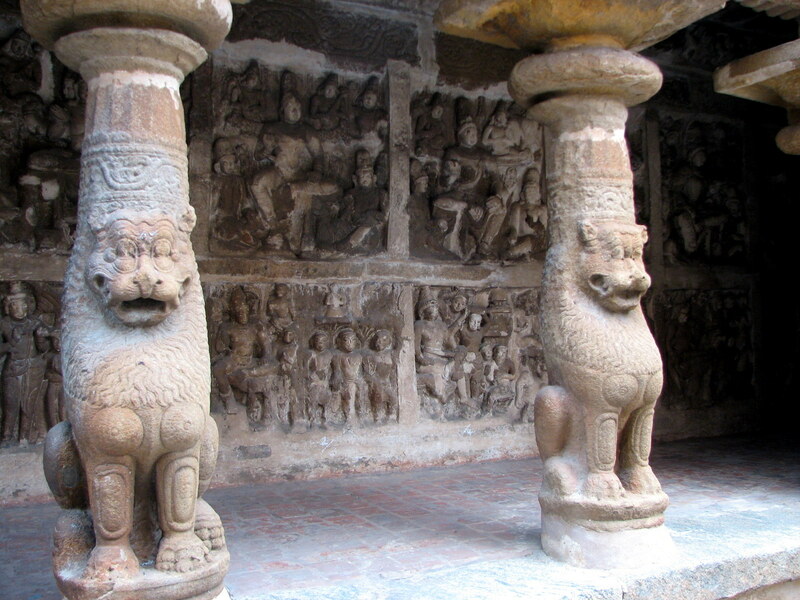 To mark these event, Parameswara Pallava is said to have built this 3 tier structure. 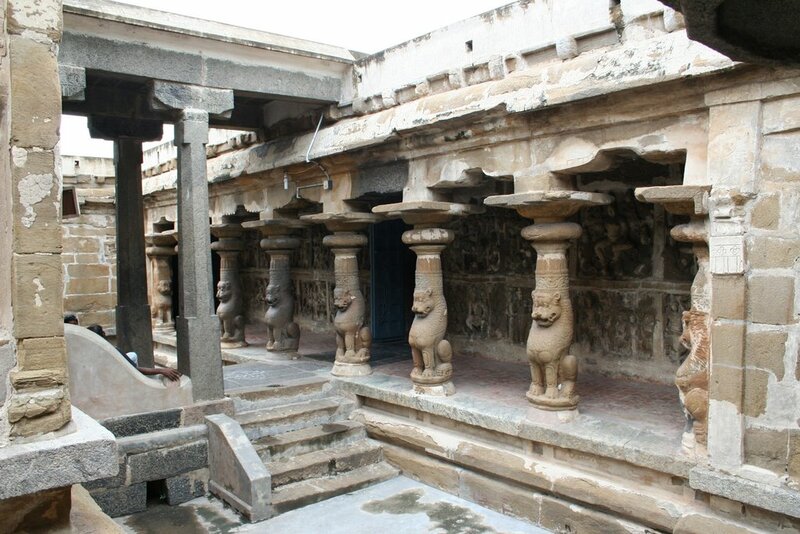 The 2nd tier is open only on Ekadesi days.The steps to the 3rd Tier are said to have been damaged during Pallava Times because of rains and hence cannot be visited anymore. So attached was the Pallava king to this temple, that he used to invoke the blessing of this Lord before he embarked on any battle, especially before he went to face their arch rivals, The Pandyas. This has been brought out beautifully by Thirumangai Azhvaar in several of his Paasurams in praise of the Lord here. The temple has beautiful old sculptures around the prakaram depicting the different stages of Parameswara’s life right from his childhood. The temple is a terrific example of Pallava Architecture and is believed to have been built by them on a single piece of rock. Legend has it that there was a secret underground tunnel laid out from this temple all the way to Mahabalipuram , on the eastern sea shore, as well as to Parameswara Pallava’s court. When Britishers got a scent of this, they came here to trace this. Coming together as one, the devotees of this temple are said to have built out steps across the tunnel to the temple sannidhi, thus turning away the Britishers. Prayer in the temple cleanses the devotees of all their sins. Those seeking wedding and child boons pray to Perumal. People offer sweet pudding (sarkarai pongal), curd rice and flakes (Aval) nivedhanas to Lord and Mother. 10 day Vaikasi Brahmmotsavam in May-June and Vaikunda Ekadasi in December-January are the festivals celebrated in the temple. The temple is open from 07:30 a.m. to 12.00 noon and from 04:30 p.m. to 07:30 p.m. The temple is at a walking distance from Kancheepuram railway station.